1 BDFT = 12" x 12" x 1"
Open Cell (Low Density/Sound Barrier) spray foam is commonly used as a sound insulating foam for home theater rooms and other interior walls. Open cell sound proofing foam has a higher expansion rate and each kit yields a higher volume. This low density soundproof spray foam (0.75 lb/ft™) cures to "spongy" in about 3 minutes. This acoustic spray foam insulation product qualifies for a 10%* credit on your 2015 taxes. 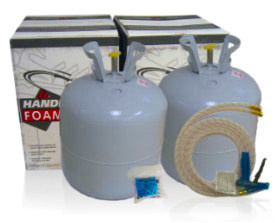 All soundproofing spray foam kits include: Both tanks (A and B), Gun/Hose Assembly and Spray Nozzles.